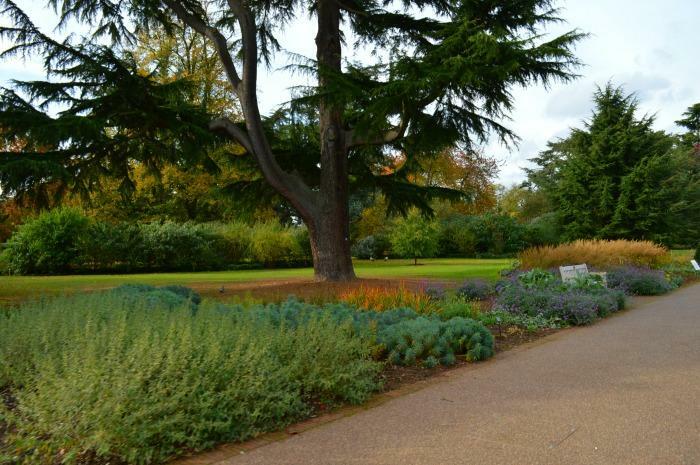 Kew Gardens is a beautiful open space in Richmond Upon Thames, South West London. A while a go, the girls and I were invited to visit Kew Gardens for the day by The Original Muck Boot Company. 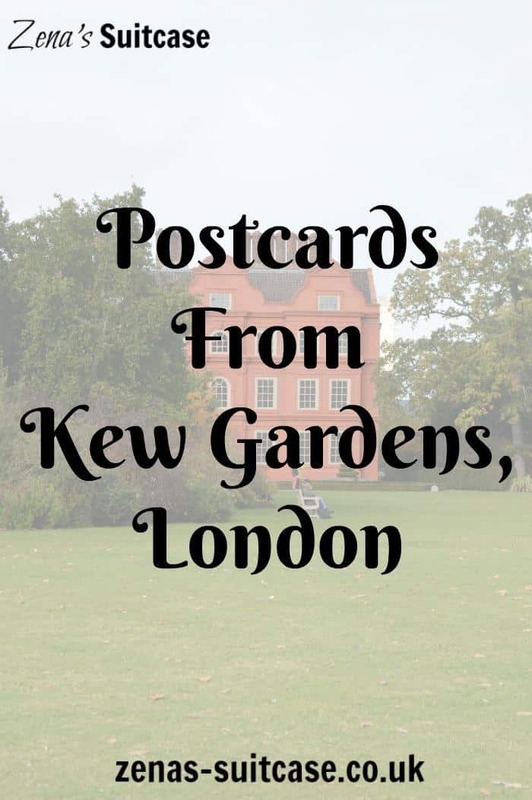 I was really excited to take the girls to Kew Gardens to explore, as it was a place that none of us had visited. 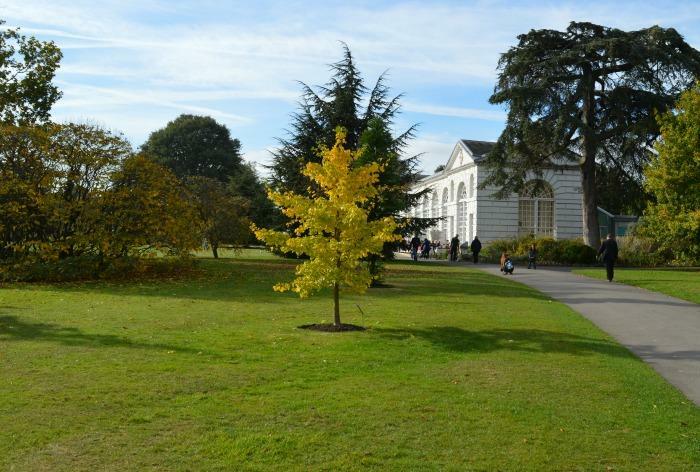 Kew Gardens attracts all kinds of visitors as it’s a beautiful place, full of iconic buildings and rare and significant plants. It also attracts lots of families who enjoy open spaces with their children, and it definitely impressed us during our visit. For some reason for this trip to London, I broke my golden rule. I never normally drive to London, but for this trip I decided I would. To say it was stressful was an understatement, and we ended up being late for our event. 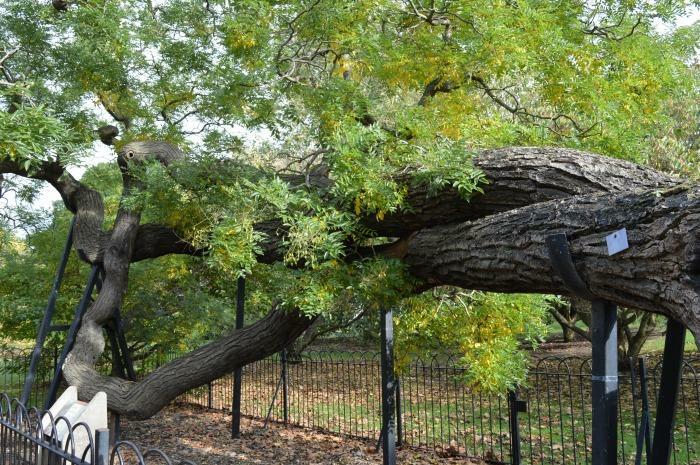 Fortunately we were still able to explore the Royal Botanical Gardens, and the experience made it all worth it. I loaded the kids up in their Crotec Wagon and we headed in the direction of The Orangery in search of coffee and cake. After a stressful drive, only coffee and cake will hit the spot, right? 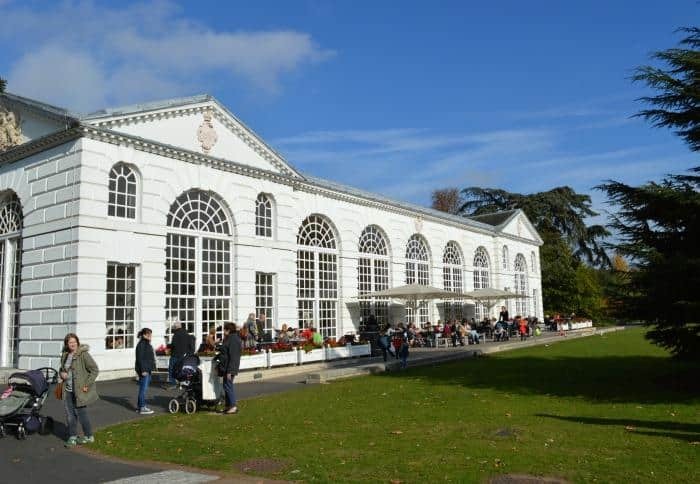 The Orangery looked really busy, so we carried on towards a family friendly cafe for our refreshments. We enjoyed our little break, but be warned, the cafe’s are pretty expensive here, so I would definitely recommend taking a picnic and your own snacks. 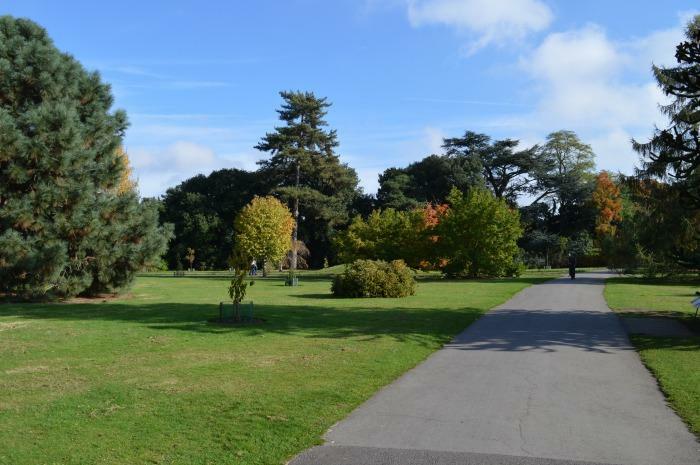 To say we were visiting in Autumn, the weather was really kind to us and Kew Gardens was still looking very green in parts. 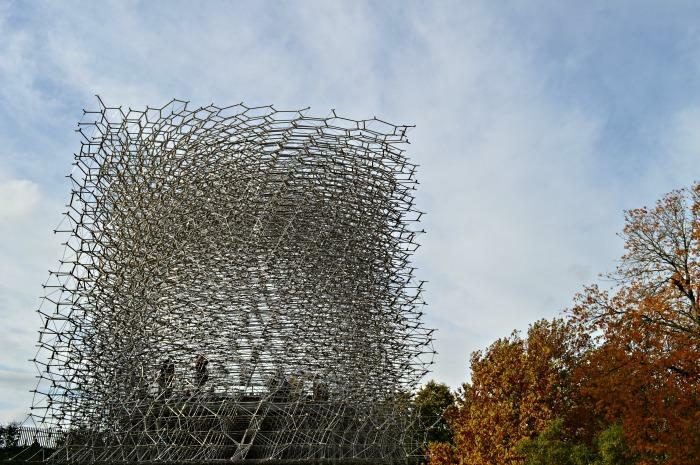 There’s a lot to see at Kew Gardens, and places like The Hive are very impressive. Our next stop was the Princess of Wales conservatory, which was full of tropical plants and some of the most impressive water lily’s I’ve ever seen. 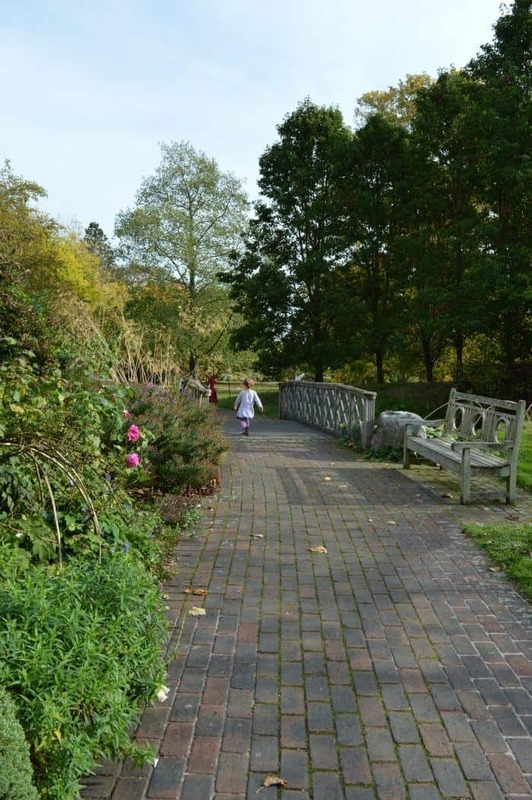 The children really loved exploring in here with all the walkways between the luscious green plants. It would have been nice to stay a little longer to take more in, but children are often in such a rush aren’t they? 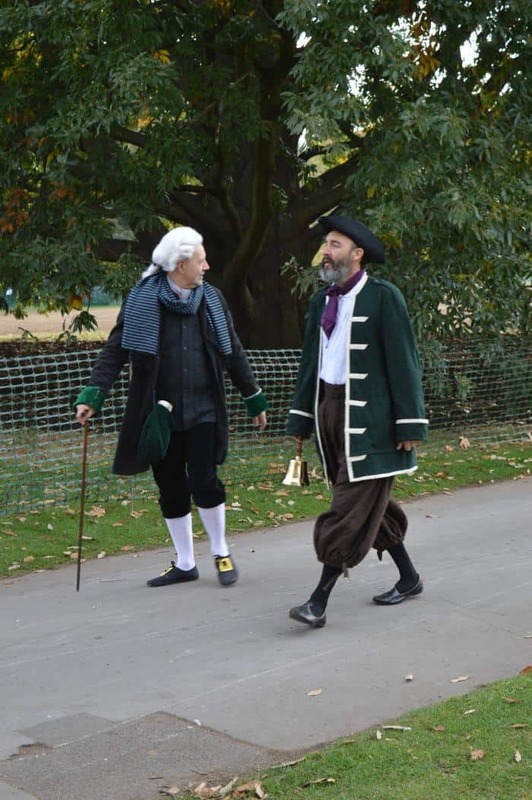 During our visit to Kew Gardens, they were celebrating Capability Brown’s birthday. 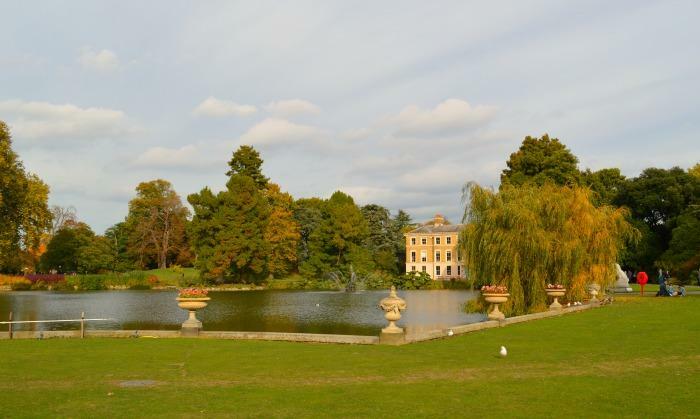 He was of course the famous landscape architect who worked on a number of famous Royal gardens in his time. The children were fascinated by the period costumes and the horse and cart. 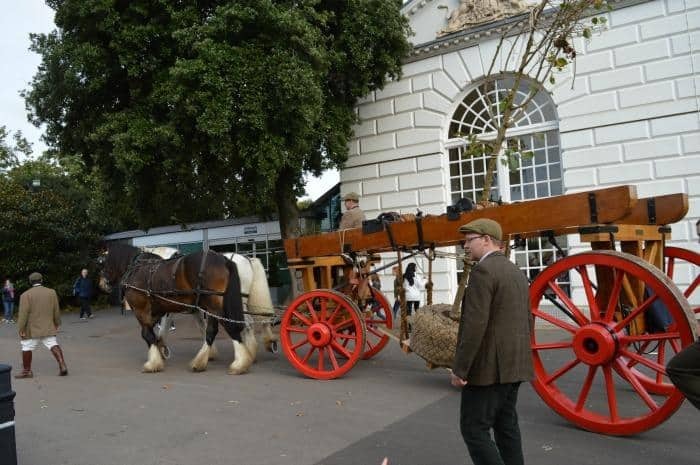 We decided the best way to see the whole site was via the Kew Gardens land train. My girls are a huge fan of going on these trains, and it definitely makes Mummy’s life a bit easier too. 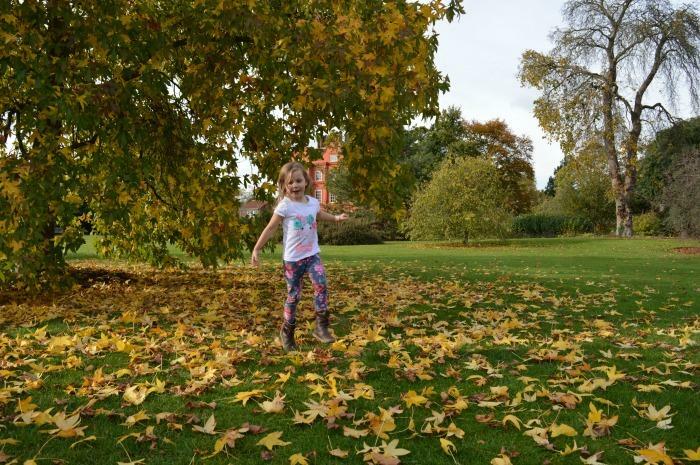 While we were waiting at the stop, we couldn’t resist playing in some of the leaves that had fallen for the season. The train is a good way to get around, certainly when you are pushed for time. We would never have seen the Palm House by foot, as the girls were in and out of the trolley so much wanting to explore. This can be a blessing and a curse in equal measures. I couldn’t miss the beautiful lakes either. 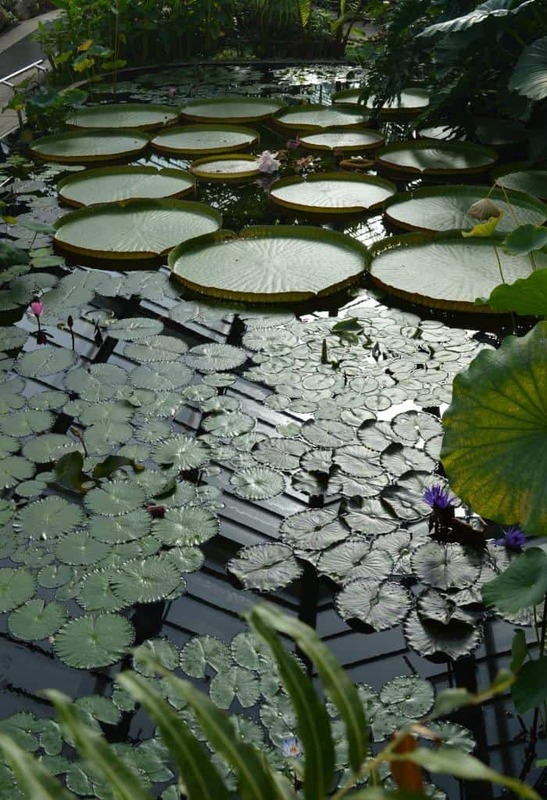 There’s so many parts of Kew Gardens I’d like to see more of next time we visit. The girls had lots of questions to ask about this tree, which sadly I couldn’t answer at the time. It was lovely to see how curious they were though, and how much they were taking in about the beautiful and interesting surroundings. They were clearly inspired by what they had seen, and when we got off the train, they developed a second wind and seemed determined to cover more ground. Children don’t often grasp just how much there is to see do they. 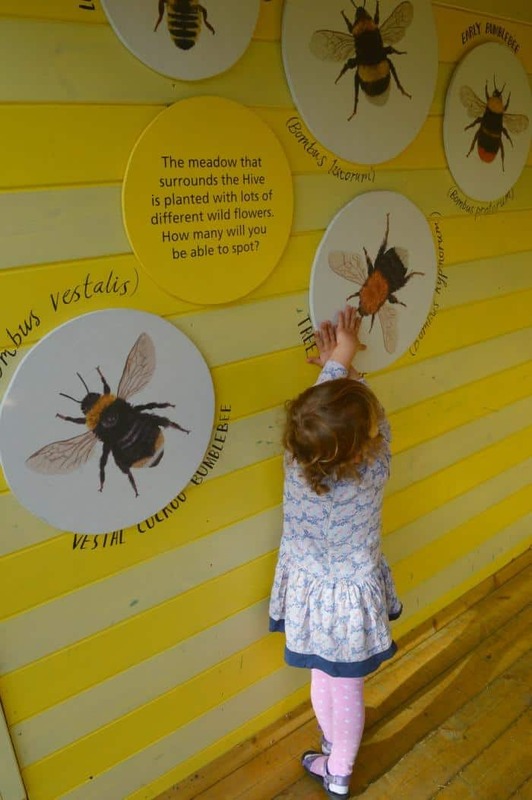 The bee information at Kew Gardens was definitely a big hit. Walking around Kew Gardens with the girls was such a lovely day out for us. It made up for the very stressful drive to get there, and made getting home again equally worth it. 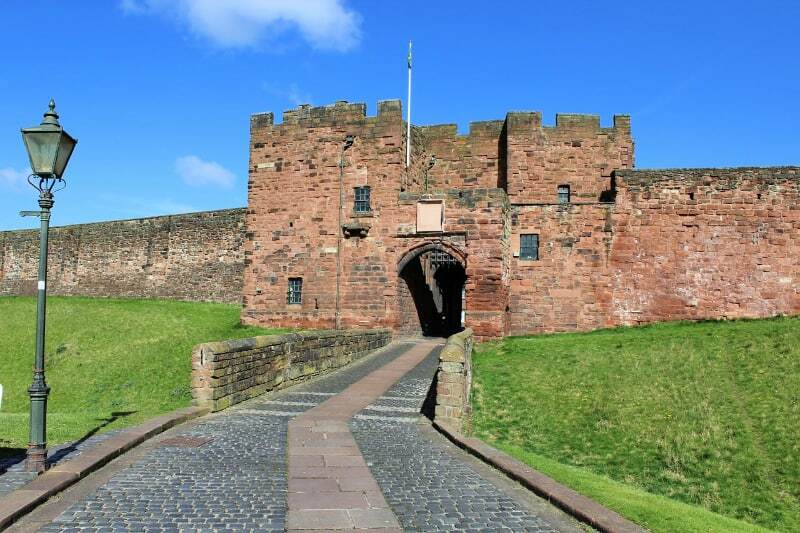 It’s such a calming place for a family day out, and there’s lots to learn too. I’ll be very surprised if you don’t see one of these during your visit. 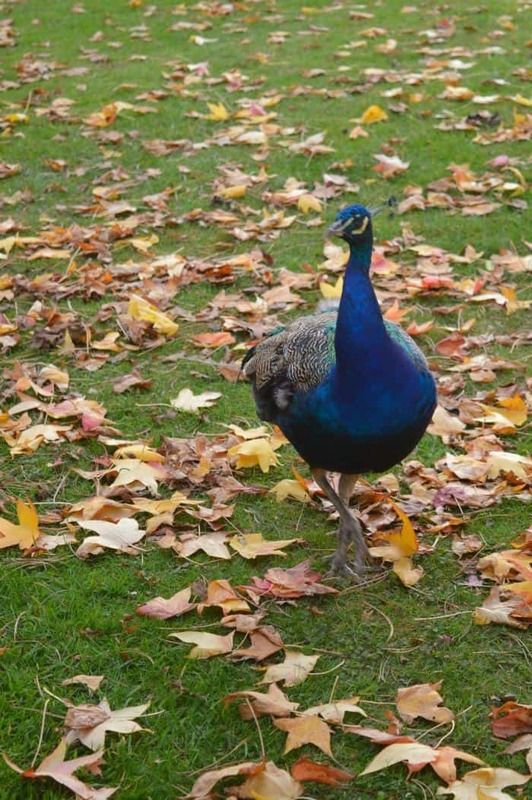 Peacocks are such stunning birds, and there are plenty living around Kew Gardens for visitors to enjoy. We had a fantastic afternoon at Kew Gardens, exploring the outdoors and enjoying seeing other families make the most of this beautiful place. 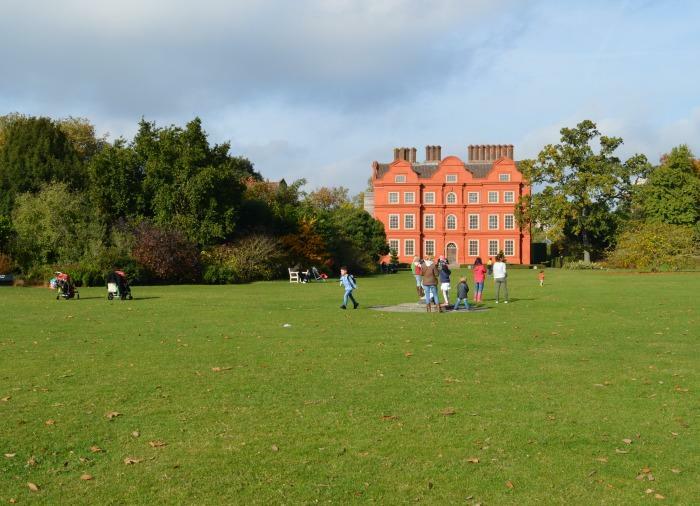 If I lived in London this would be one of my favourite places to visit with children. We will definitely be going back, armed with a picnic and hopefully more time on our side too. 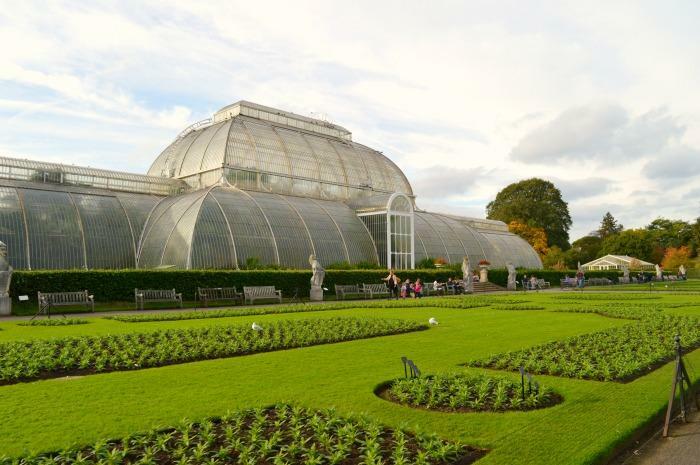 Have you ever visited Kew Gardens? What was your favourite part? 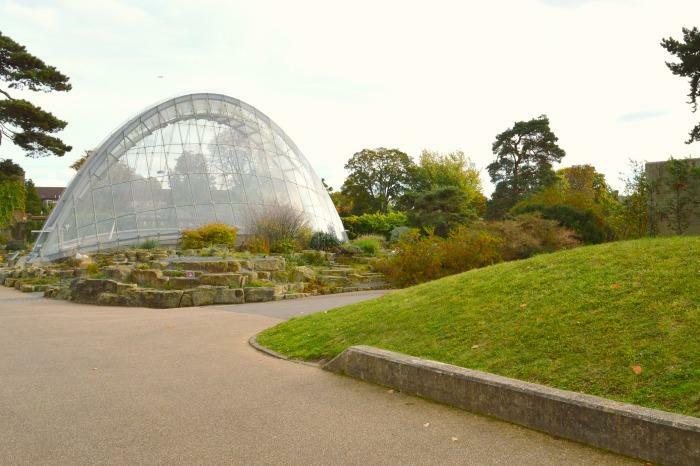 I’m with you with driving in London, but isn’t Kew stunning? I really must get there this year. Looks like a lovely place to visit. Love the photos. I went when I was in primary school & this post has made me want to take B, it looks so fantastic & looks like its changed a bit. I LOVED the massive green houses that were all toasty warm for the plants! What a fab day out! Gorgeous photos…..Feels like I’ve been! They are impressive lilies, and I love the period costumes, too. Your whole set of photos is gorgeous, thanks for sharing them with us! I remember going when I was a youngster, looking at amazing plants inside a giant glass house. I must visit again sometime! these are lovely photographs. How I wish I can visit this place in the future.